I'm not a big fan of award shows. Sure, if I have nothing else to do or watch, I might see a little of one but in general they mean very little to me. The major reason for this is the subjectivity involved with saying something was 'the best' that year. Yes, film awards are voted on by actors but... what if they were voting on films that they themselves would like to be in? A little twist like that would likely push out any big budget film and focus on ensemble casts with meaty parts and controversial stances... like what they had to choose from this year for Best Picture. Yet, not all the films cleanly connect with what the people want to see. When I started thinking about this, I stumbled on a fact nestled in the middle of an article about Mariah Carey "reigning supreme" at an award show. Essentially, Jamie Foxx was honored with the Quincy Jones Lifetime Achievement Award at the 20th annual Soul Train Awards. Yes, the man has released only 2 albums (1994's Peep This and 2005's Unpredictable) and they honored him for his 'life's' work. I along with many people believed he performed very well in the film Ray. I even watched him on In Living Color and Roc. But, isn't Quincy Jones a musician? They should be honoring this person for his contribution to music during his lifetime. Maybe, Unpredictable was so amazing that they decided it equaled the life's work of many other musicians. All I know is that it gives me one more reason to believe that award shows are created to place things on pedestals that might not belong there. They should change the look of the Oscar so that he's actually patting himself on the back. I completely agree - these awards mean absolutely nothing. 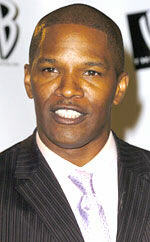 I can't believe anyone was able to justify a lifetime achievement award to Jamie Foxx, 'lifetime' being the key word. I enjoy the Academy Awards, but I eschew all other award shows with a vengeance. It is a good day when I can use the word "eschew"
I HATE award shows! Thank god for good books! I am not a big fan of award shows myself... The amount of the award shows have gotten out of hand. Pretty soon they will have an award for award shows... if that makes sense. If I am interested in an award show, I'll look at E-Online during the course of the show's East Coast broadcast. And don't get me started on the Red Carpet stuff...I know Amy loves it, but to me it's like watching the Super Bowl pre-pre-pre game show. No substance.